I’m sure you know about the Internet Movie Database, or imdb.com, another one of those internet time sinks that has information on almost every movie ever along with almost every actor ever, the parts they’ve played, etc. 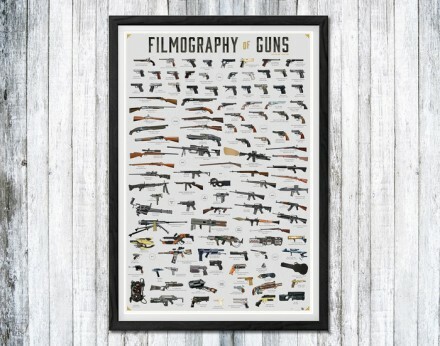 Since this is the internet, where just about any damn thing can be found, and copycats are common, somebody made a similar site in the form of a Wiki, but with firearms as the primary focus instead of movies and actors, even calling it the internet movie firearms database. On the site, you can look up what movies, television shows, and video games a firearm has been in, what firearms a movie, television show, or video game has featured, and even what firearms and in what show/movie/video game an actor has used. It’s pretty exhaustive, which makes games of 6-degrees-of-a-Beretta-92F all the easier to play. Ever Heard Of The Winchester Ringblaster? It’s an 8-gauge industrial shotgun, used to fire zinc loads to break slag out of kilns or furnaces. Posted in As Seen On Youtube, Gun Pr0n | Comments Off on Ever Heard Of The Winchester Ringblaster? 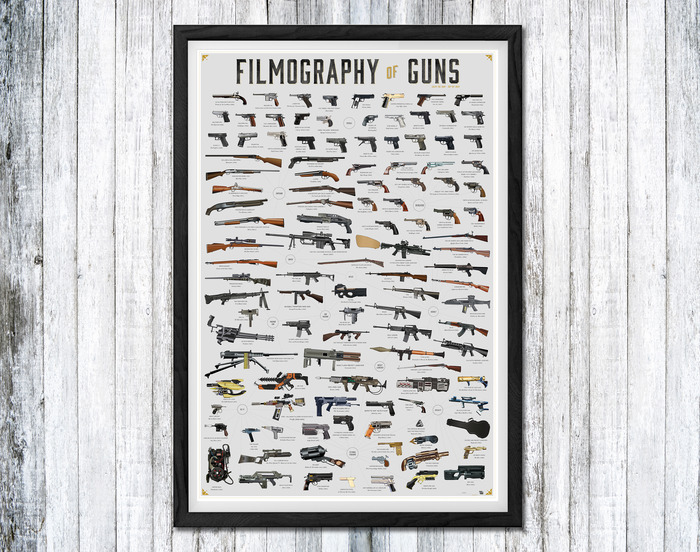 The ‘Filmography of Guns’ is a project by Cathryn Lavery to create a print that features 115 individual illustrations of iconic guns – real and fantastic – in television and film, featured on a single, large print. 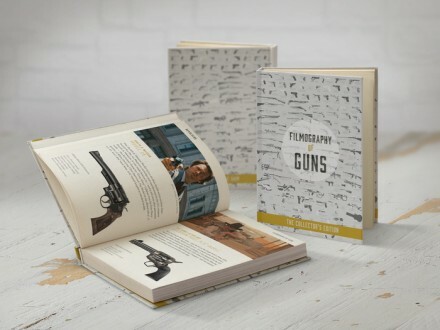 In addition to the print, an in-depth book featuring all 115 guns is also being offered. This project has already reached its baseline funding goal, however you can still donate to secure a print, book, or reach the higher stretch goals for even greater rewards such as the custom collector book plate. LAS VEGAS, NV – Arsenal, Inc. is introducing a new configuration to our successful line of Bulgarian-made SAM7K 7.62×39 caliber pistols, now with Sig Sauer’s SB15 pistol stabilizing brace*. The first variation of the SAM7K pistol was introduced in 2013, and became an instant success. The SAM7K pistol is manufactured with Arsenal’s exclusive forged then milled receiver, original Bulgarian hammer forged chrome lined barrel, flip-adjustable peep rear sight, and ambidextrous safety lever. The Sig-Sauer SB15 pistol stabilizing brace used on the SAM7K-03 is a veteran-designed aid that is made to improve the single-handed shooting performance of a pistol. By using the operator’s forearm, it provides a stable support to reduce felt recoil and minimize accuracy-robbing spin and shift. The stabilizing brace sits on the receiver extension, and the flexible cuff with two adjustable nylon straps allows the brace to be custom fit to any user. The receiver extension has a water proof storage compartment with a sealing threaded cap. It is accessible when the brace is removed or pushed all the way forward. 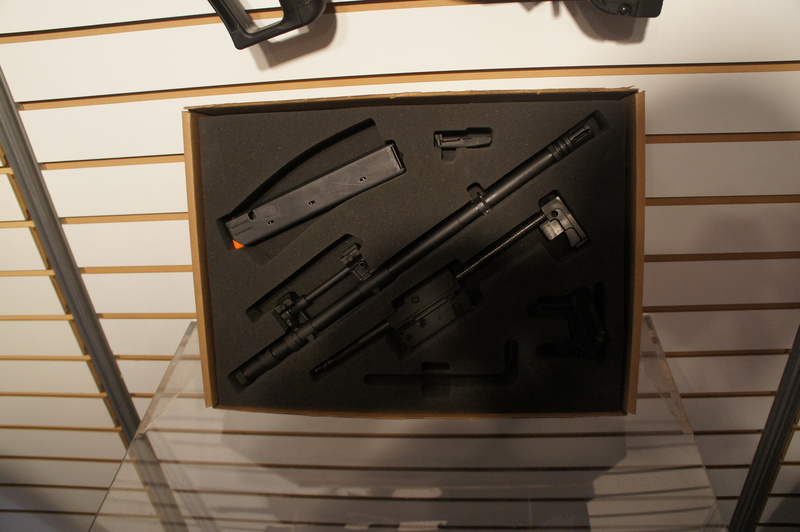 * The SB15 Pistol Stabilizing Brace is manufactured and provided by Sig Sauer. 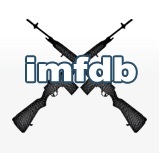 This product has been reviewed by the BATFE and was determined that it does not alter the classification of the firearm or subject the firearm to NFA control. To download the BATFE compliance letter, click here. 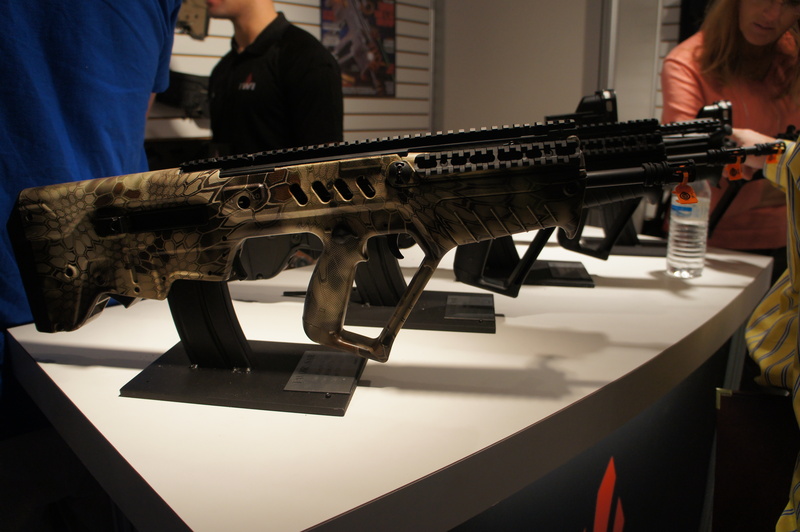 Sig Sauer donates $3 of every SB15 sold to support the veterans of HAVA. Chances are good you’ve never heard of the Schwarzlose 1908 Blow-Forward pistol. It’s one of only a few blow-forward operation pistols from the late 19th/early 20th century, and saw limited commercial success. Tennessee Arms Company is offering what they call the “Ghost Gun”, a clear stripped AR-15 lower receiver. 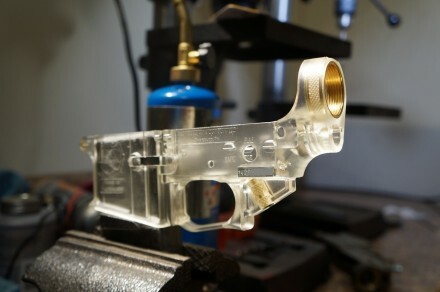 Made from UV stabilized Nylon that is highly resistant to oils and lubricants, the Ghost Gun is a fully functional lower, although tnarmsco notes it is intended more as a teaching tool and for product showcase than for hard use. If anything else, it’ll definitely make for a great conversation starter at the range. Pair it with a transparent magazine or two for double the fun. This latest video from TrackingPoint details a 3rd generation Marine, Michael Jernigan, who was blinded by a roadside bomb while in service. Assisted by a spotter utilizing the broadcast capability of the TrackingPoint scope, Jernigan was not only able to strike a target from 700 yards, but was also able to successfully track a trophy Blackbuck. 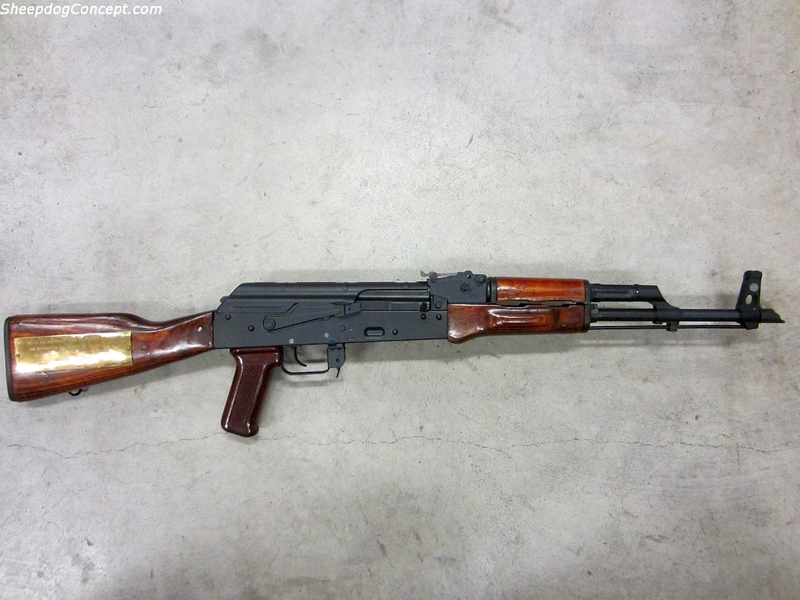 User Sheepdog Concept on Gunbroker is selling an AKM that was brought back to the US by U.S. Congressman Charlie Wilson after a visit to Afghanistan during the Soviet invasion. Comes with a copy of the original Form 10 documentation with Wilson’s name on it, and a 75-round drum magazine. The asking price? $125,000; definitely for serious collectors only. Ares Armor is now offering an improved polymer 80% AR-15 lower receiver kit. The new kit fully complies with the GCA of 1968, featuring a solid core with no indexing marks. The lower receiver features a solid core design, stiffened magwell, and beefier buffer tube housing, with a unique, no-thread pistol grip area unique to these lowers. The kit comes with a one-time use polymer jig and all of the bits and end-mills necessary to complete the 80% lower. No machine shop required. The new kit is currently available in Black on the Ares Armor website. TrackingPoint recently released a video demonstrating how their line of Precision Guided Firearms to track moving targets. Target velocity is measured by an Inertial Measurement Unit within the scope to track the background relative to the target. This data is used by the automatic ballistic reticle to set the target lead. WANAMASSA, NJ (May 2014) – Eagle Imports, Inc., the exclusive distributor of Metro Arms, Bersa and Comanche firearms products, did not jump on the polymer pistol bandwagon without first consulting their loyal customers. The Bersa BP9CC was the result of dialog between customers and engineers to come up with a lightweight, compact and ultra-thin concealed carry pistol that delivered on reliability, accuracy and price. 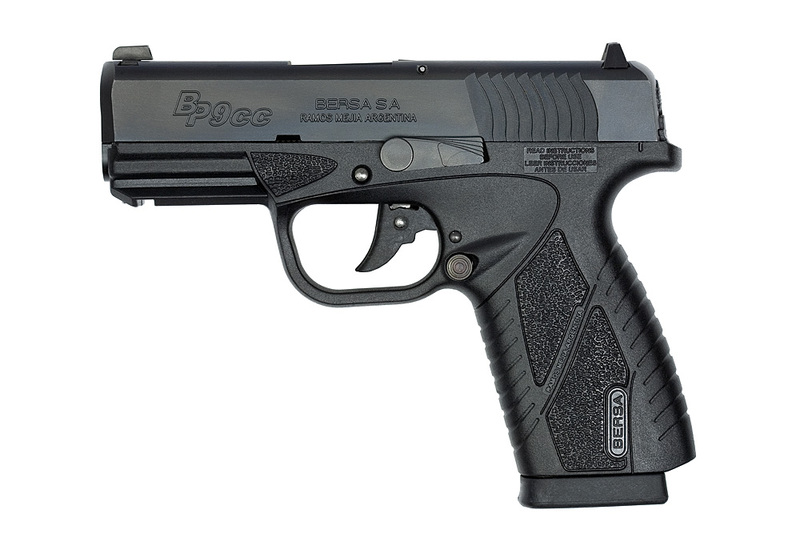 The Bersa BP9CC is built ergonomically from the integral grips and comfortable length of pull to the line-of-sight, all providing the user with greater control and confidence during use. Additionally, the Bersa BP9CC has the shortest trigger reset and a smooth trigger pull, making it a best-in-class in the concealed carry division of firearms on the market today. The striker-fired pistol features an integral locking system, loaded chamber indicator and automatic firing pin safety. The frame has a Picatinny rail feature for the addition of lasers and lights. The barrel bore has been micro-polished with sharp, deep polygonal rifling that result in shot after shot accuracy. The magazine release is ambidextrous and the sight system is a very visible 3-dot sight system. The Bersa BP9CC is available in three finishes: matte black, Duo-tone (matte black frame and stainless slide) and Duo-tone in matte olive. Every Bersa BP9CC ships with two magazines in a hard plastic, lockable pistol case and the Bersa limited lifetime warranty. MSRP starts at $475.00. For more information on the Bersa BP9 Concealed Carry pistol visit www.bersa.com or contact your favorite firearms retailer today to see one in person. Designed at the request of a large animal doctor who was called out to deal with animals that have been hit by cars on the Autobahn, the VP9 (Veterinarian Pistol – 9mm) is a quiet, single-shot pistol intended use when putting down injured animals and wounded game. The pistol and suppressor components of the VP9 were developed simultaneously to produce the most quiet 9mm pistol in the world. 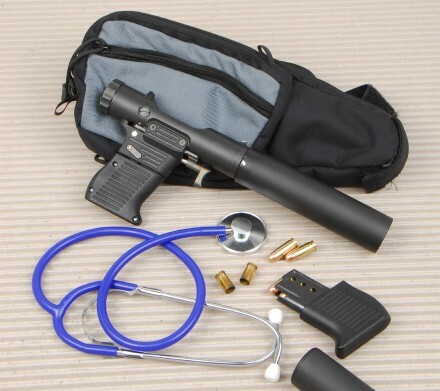 Capable of a reduction of 31.5 dB, the suppressor is designed so that even standard 124 gr. FMJ ammunition won’t reach supersonic speed, producing a noise level as low as 129 dB – roughly the same level of noise as a car door closing; use of subsonic ammunition further lowers the sound signature to around 125 dB. In fact, according to B&T, the shot is so quiet that manipulating the bolt-like-action to cycle another round is louder than the shot itself. No word on when the VP9 will be available for purchase, however it was featured in the April 2014 issue of the B&T Partner Update, so expect further updates soon. LAS VEGAS, NV — Arsenal, Inc. is proud to announce the expansion of its SAM7 Family products. The SAM7UF rifle is the latest in the growing group of firearms to join the modern SAM family and incorporates the latest technologies, quality, and workmanship the American market has come to expect from Arsenal and SAM7 series. The SAM7UF is a 7.62x39mm semi-automatic rifle, manufactured on Arsenal’s legendary hot-die forged and milled receiver and incorporates the modern under-folding buttstock. Loyal to its traditions, Arsenal has manufactured the SAM7UF rifle with all mil-spec and premium components, including the hard chrome lined hammer forged barrel, reinforced polymer pistol grip and hand guards, stainless steel heat shield, the 90-degree vertical gas block with bayonet/accessories lug, and the original 14x1mm left-hand muzzle threads. The SAM7UF utilizes the modern straight-back under-folding stock, which locks perpendicular to the action and the bore of the rifle. In order to provide a more secure and firm lock, whether in a folded or extended position, this stock locks on both sides of the receiver with 4 solid pins. This, with the additional reinforcement in the arms of the stock, stabilizes the rifle, which significantly reduces the climb, and gives the shooter much firmer control over the firearm for improved accuracy and effectiveness. 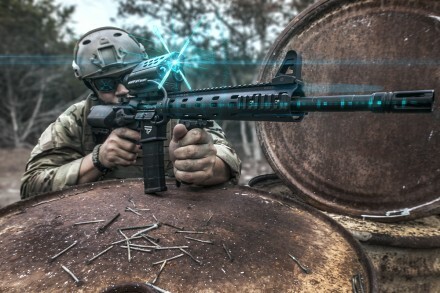 On top of this already amazing introductory price, the first batch of rifles will include a $50 coupon toward purchase of Arsenal accessories from K-Var Corp.
PHOENIX, AZ (March 2014) — Patriot Ordnance Factory proudly announces our new POF-USA Rifle – the Puritan Model – an entry level P15 in 5.56 / .223. The Puritan is a combination of our already popular regulated short-stroke gas piston system and our NEW E² extraction technology. 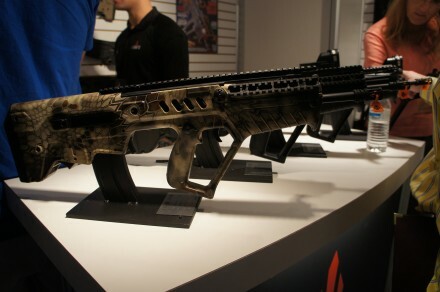 The Puritan rifle is an evolutionary update for POF-USA in reaction to changing landscapes of the economy. We are now able to offer an entry level super reliable, quality driven rifle at a reasonable price! It’s loaded with state-of-the-art exclusive POF-USA features. Our Puritan boasts features that include the E² extraction technology; gas regulated three mode piston operation, drop in trigger assembly with crisp 4.5 pound trigger pull, roller cam pin assembly, enhanced anti-tilt buffer tube, and plated one piece bolt and bolt carrier — the same parts used in our flagship line. This rifle has been built and designed on the premise of the company founder, Frank DeSomma, that everybody should be able to own a POF-USA legendary short- stroke piston weapon system. Our entry-level optics ready platform is built with mil-spec aircraft grade forged aluminum uppers and lowers. The ejection port is embellished with the words God Bless America and our USA Flag. MKS Supply, LLC, Dayton OH, March 2014 – Mfour .22 LR Rimfire carbine still a great and low cost fun firearm. The Chiappa Mfour fires economically priced .22 Rimfire ammunition for a ton of some serious practice for its “bigger” 5.56mm /.223 brothers. Even in today’s .22LR hoarding situation the .22 LR is a real bargain compared to center fire ammunition. The military lookalike Chiappa Mfour carbine is a terrific ultra-quality, accurate, serious platform to keep skills up or for transition to its big brother center fire carbine. And probably most important, the Chiappa Mfour is a bunch of fun! The Chiappa Mfour comes with a detachable (dual aperture adjustable iron sight) carry handle assembly and Picatinny flat top for optics. 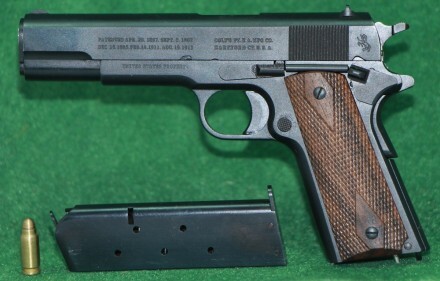 This is a fully functioning M1911 at 1:2.5 scale. Locked breach action, functioning grip safety, and chambered for a 3mm round with a muzzle energy of up to 3 Joules. Taken at SHOT Show 2014, these pictures show the 9mm Parabellum conversion kit for the Tavor SAR. 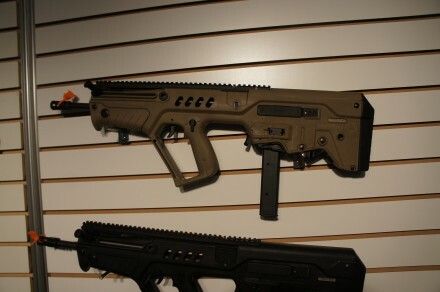 The kit comes with everything needed to convert the 5.56 Tavor into a pistol-caliber carbine: a 1:10 twist CHF 17″ barrel, blowback recoil assembly with bolt and carrier, 9mm magazine magwell adapter, 9mm deflector, and 32-round magazine. They also threw in a barrel removal wrench. Although the kit isn’t currently up on the IWI website, a few online vendors have listings for the kit. Aero Precision’s “I’m your huckleberry” semi-auto AR-15 lower receiver is machined from 7075-T6 aluminum and is Matte Black hard-coat anodized. Marked “Cal Multi”. Works with standard AR-15 components and magazines. Rear takedown pin detent hole is threaded for a 4-40 set screw. Check out this video of Jerry Miculek breaking his previous world record of firing 6 shots from a Barrett .50 cal in under 1 second. There’s even high speed slow motion, so you can just catch each bullet leaving the barrel. We were recently lucky enough to be invited to a range day sponsored by Osprey Armament – in association with Defense Logistics Support and PWT3 Development. This “Overmatch Concepts” Range Day was held at the Osprey Range located in Council, North Carolina. Our host for the day’s events was Retired US Army Major General David Grange, head of Osprey Global Solutions and a legend in the Ranger community. The event kicked off with the usual admin brief for range safety and MEDEVAC plans along with the facility layout. Then, General Grange jumped right into a brief overview of the day’s events, which included an operational vignette, weapons demonstrations, and round robin group visits of products and services from partners of Osprey Global Solutions. As it turns out, the day was set to be filled with a wide variety of technologies ranging from low to high tech. In addition to weapons there were ISR capabilities including trackers and forensic evidence collection as well as medical, and training demos. While some of it might seem old-hat, the attendees included military, LE, first responders and industry. Everyone saw something new. The Operational Vignette was a scenario involving a raid on a terrorist bomb making element that has infiltrated the area of the Cape Fear river, represented by the buildings down range. A tracking team confirmed the location of the bomb making element, and passed the information along to an assault team who took down the building. Afterwards, an EOD team disarmed the explosives while a rescue team stood by to provide rescue and medical services as needed. It was constrained by both time and the limits of the facility but included examples of a wide variety of the “Overmatch Concepts” that were the point of the entire day. One thing I noticed was a lot of work on battlefield obscurants. Long a bailiwick of the military engineer community, it was refreshing to see a renewed effort on their application for some more non traditional roles. MSI Delivery Systems was on hand, supplying obscurants via their AB2K Multi-Mission Aerosol Delivery System. The standalone version of the AB2K-MMADS is capable of dispensing up to 50,000 cubic feet of smoke coverage per load. A dependent version with a high capacity backpack can dispense over 320,000 cubic feet of smoke coverage. Additionally, the AB2K-MMADS can easily be configured to dispense smoke mixed with irritants for crowd control, or specialized chemicals for uses such as decontamination and infestation control. There was also a team on hand using a remote control plane as a UAS surrogate investigating the aerial delivery of battlefield obscurants. Although it took a few runs for the effect of the test obscurant to become noticeable, testing is ongoing, and from what we’ve seen so far the system does have promise. Additionally, the obscurant used at the range was water based; an oil-based obscurant is also being tested. Look for several more stories today which provide details of some of the weapons we encountered. We’d like to once again thank MG Grange and his team for their hospitality and for setting up a great program. This story was originally featured on Soldier Systems Daily. Visit SSD to see the rest of the coverage from the Osprey Range Day. Youtuber XboxAhoy – largely known for his distinctive voice and in-depth weapon guides for the Call of Duty series – has released this video featuring the iconic Desert Eagle pistol. Strike Industries offers multiple parts kits for the AR-15 platform, including the AR Lower Receiver Parts kit, which includes everything for the lower receiver sans trigger, hammer, disconnector, pistol grip assembly, and trigger guard. 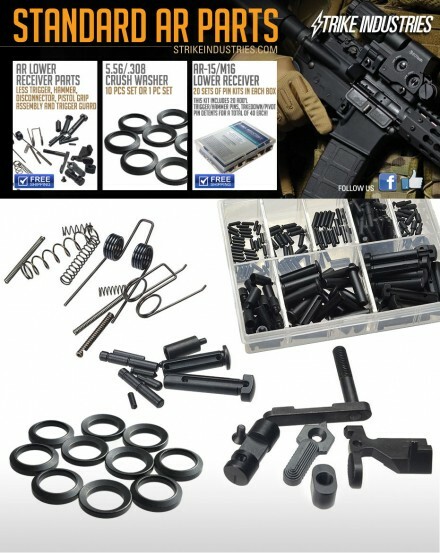 Great for building up a new rifle, or just keeping spare parts around.